While diving, it doesn´t matter if someone is restricted above water: We include all people no matter if physically or mentally affected. In cooperation with the IDDA we realize our motto "Diving for everyone!". You´re searching for a new hobby as an affected or pedestrian or you want to fulfill a dream? Then we’re the perfect choice for you! These are the keywords that emboss us. We include everyone: Starting at the weekly meetings in the clubhouse, trips such as barbecues, diving weekends or even the common Bowling Play with affected persons. Therefore the disability is of lowest relevance. 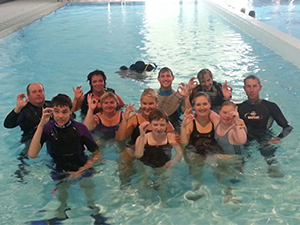 With the diving therapy we achieve, in cooperation with the IDDA, an inclusion as it should be. In cooperation with the INI we provide everyone with a physical or also with a mental impairment a diving therapy.